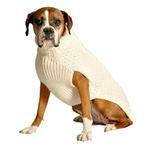 A classic look for a classy dog in the Handmade Cable Knit Wool Dog Sweater! Pull over with a high cut belly. 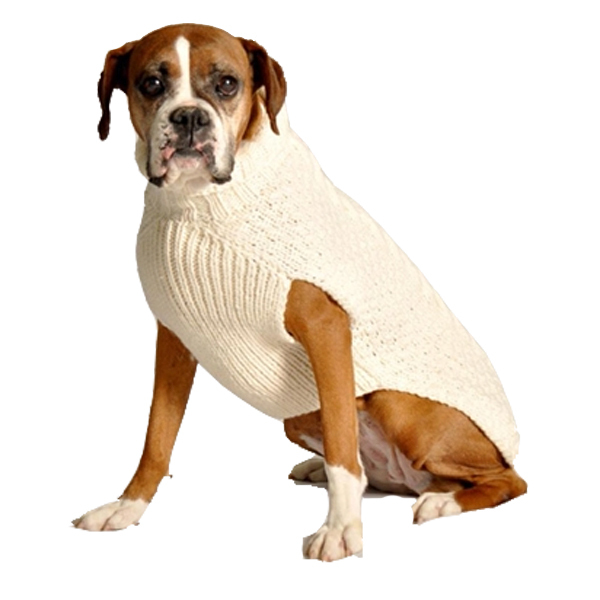 Don’t let your dog be left out in the cold without having on a stylish sweater! Sweater is a cable knit pattern in a beautiful natural color. High cut belly for a comfy fit. Handmade wool dog sweaters from Chilly Dog are made with hand knit organic wool and all natural plant dyes, perfect for the Eco-conscious pet owner. This sweater is also made following the Fair Trade guidelines and is knitted by descendent's of the Inca Indians. Because every sweater is handmade, they may vary slightly in color and style. Handmade Cable Knit Wool Dog Sweater - Natural Customer Photos - Send us your photo! Posted On 01/08/16 by Cynthia W from Hattiesburg, MS Yes, Cynthia W recommends this product! Wish this fit as well, so I will try and get it exxhanged. Posted On 12/11/15 by Margo M from , Yes, Margo M recommends this product! The wool yarn and cable knit pattern is very nice quality. The Small fits my 18lb Pekingnese mix perfectly. This is a nicely made, very warm, adorable sweater. This was my second order with Baxter Boo. Great products, shipped quick !! Wonderful company!